A desperate Treasurer Josh Frydenberg hit the airwaves yesterday attempting to scare voters into believing that Labor’s negative gearing policy would simultaneously smash house prices while forcing up rents. “Labor’s policy will make sure that people who own their home will see the value of their home be less, and fall and if they rent their home, their rent will go up as a result of Labor’s policy. “So it’s exactly the worst time to smash the housing market. “Everybody who sells their home into the future, negatively geared or not, will be worse off because they’ll be less buying in the market. “If you rent your home you will pay more because you’ll have less investors who are prepared to charge lower rents in order to get subsequent capital gains”. It’s true that Labor’s policy will hit investor demand and lower house prices, thus assisting would-be first home buyers locked out of the market. It is a ‘housing affordability’ policy, after all, which necessarily requires cheaper housing. But for Frydenberg to claim that Labor’s policy would magically force up rents is a bald faced lie. So, at worst Labor’s policy would turn houses to let into houses for sale, in the process turning renters into home owners and leaving the supply-demand equation for rental properties unchanged. “Our sense is that the relative attractiveness of new dwelling investment compared to investment in established dwellings should be a positive, at least at the margin, for new dwelling construction”. Substitute “foreign investment” for “negative gearing” and the argument is exactly the same. Josh Frydenberg needs to stop lying and develop genuine arguments if he hopes to derail Labor’s policy. Said by no landlord ever. and if they rent their home, their rent will go up as a result of Labor’s policy. “If you rent your home you will pay more …”. Sure..yeah right. If that were true, we would have already seen the 1.2 million investors lobbying for the removal of Negative Gearing years ago…. A Treasurer who doesn’t understand Economics 101 – No wonder we are so f***ed !!! That’s a bingo right there! You don’t make friends with knowledge. No one cares about economics any more, they only care about Scottenomics which is massively superior for jobs and growth and getting ahead. My body can no longer survive without the drugs that are killing me! Michael Jackson approves this post: 3 ghostly thumbs up. I thought you might enjoy this excellent Michael Jackson clip. Let’s also remember that Labor’s policy will continue to allow those with investment income to negatively gear new investment in established homes, so we don’t actually know how many people it will stop. Not all but it is likely to discourage many of those who think being able to claim losses on rental properties against their salary income is the best thing since sliced bread. Giving that mob a juicy carrot in the form of NG and a 50% CG discount on new construction should keep them happy. Even if their enthusiasm may mean that the supply of new housing will be such that capital gains may prove to be a bit thin on the ground. According to MB (at least more recently, after they updated their narrative) it is mostly the wealthy who take advantage of NG and they are the most likely to have investment income to continue with the status quo. Sadly Leith refuses to even mention that the Labor policy has this loophole. I agree with your suggestion to keep the 50% discount for new properties. How have we updated our narrative? I think you are being overly pedantic with your investment income line. Labor’s policy is not perfect, but it is much better than the status quo. If we only accepted perfectly formulated policy, nothing would ever get done. Don’t let the perfect be the enemy of the good. Try being pragmatic for a change. It all depends on the definition of wealthy but even the high wage earners (who may have other investment income) still enjoyed being able to set off NG losses against their wage and salary income so even they will miss the lurk. What concerns me is that so many are dismissive of the risk that Bowen is running by not leaving the 50% discount in place for new construction. It is particularly weird considering the ALP reckon they are going to keep running immigration hard. If they are serious about improved affordability they are going to need more than the 700 cranes working now and a shedload of capital pumping in their direction. “However, while property investment is more prevalent amongst higher income earners, the bulk of rental properties are held by middle-to-lower income earners, with 74% of all property investors (72% of negatively geared investors) earning less than $80,000 per annum in 2010-11. In recent years various income statistics have been used to either paint some of these people as high income earners or more heavily lean on the groups with highest $ volume in deductions instead of overall number. It’s true that no policy will be perfect, but why should that excuse you from objectively analyzing them? If your idea of pragmatism is holding one political party to account, smashing them day in day out, while another sneaks through dodgy, half baked policies that will cause new issues, then I’m not interested. I was wrong in 2013 and didn’t realise that $80k was in fact at the higher end of the income scale. I changed my view once I realised my error, as well as when other data came to light (e.g. ABS income distribution data). The rest of your critique is ridiculous. Labor’s policy is far better than current arrangements, simple as that. Sure, I’d prefer no grandfathering and no special exemptions, but it’s what we’ve got and it’s a massive improvement. Stop being so damn pedantic and look at the bigger issue for once. You are like a child that complains when they don’t get everything they want. That’s the last time I will respond to you today. I’ve got better things to do. Great. Look forward to reading that in your future articles on Labor’s negative gearing policy. Judging by the non-stop bleating from the property lobby, obviously many will stop. Otherwise they wouldn’t be screaming so loudly. Join the dots. Will the screaming be loud enough to cause labor to reconsider once in power? How loud was the screaming for NZ to maintain immigration status quo? That’s not my understanding. Labour say they will not allow any NG tax discounts on any and all future purchases of 2nd hand, established residential real estate, at a point not long after they attain government. Whether the buyer already owns existing negatively geared IPs (or not) is irrelevant. The “grandfathering arrangement” (as regrettable as it is) only locks in NG for properties purchased up to and until the ALPs cut off date. After that, it will only apply to brand new properties in multi unit developments. Thus encouraging the demand for new builds, in preference to boosting demand for existing housing stock that was built many years ago. When coupled with the reduction in the CGT discount, it is clear improvement on the current situation. A situation which has favoured, indeed encouraged unproductive speculative investment in established RE as an asset class. The ALPs intended changes to negative gearing are certainly not ideal and far from perfect. However they are a step in the right direction and way better than existing Coalition policy. And on the right side of wider public opinion. I think you are missing BB’s point – that is the ALP policy will only prevent you from offsetting losses incurred in deriving income from property again salary and wages. Therefore if you have a loss on one investment property, you can offset it against, say, any dividend income you receive. So it is unlikely that the wealthy will be significantly affected by the ALP change (and indeed, it perversely hands them an advantage when it comes to acquiring established properties). Couldn’t have said it better Jason. Is Labor’s policy of only allowing the wealthy to continue negatively gearing new investment in established homes better than the status quo? I’m not so sure it is. Bb – yeah, I think it’s an improvement in status quo. When considered from a housing affordability point of view. You are speculating what wealthy people may do and there is not much evidence. They will lose the ability to negatively against salary and income just like anyone else. That is a real and substantial loss of lurk. Whether they or anyone will continue to punt on existing property after the proposed reforms is anyone’s guess. The problem with your theory is that punting on CG on existing property is not going to be much fun for the wealthy if no one else is doing it. They are not going to be thrilled about claiming losses against other investment income if capital gains on the class are poor and there is a 25% discount not 50%. Your concern may be theoretical only. Anyone talking about the impact of changes to negative gearing is only speculating what might happen without much evidence. I typically don’t talk in absolutes like the bloggers here (e.g. “Labor’s policy will hit investor demand and lower house prices”). Even after any change there will be disagreement about the impact it had. I mean there is still no economic consensus around what happened in the 1980s, because economists cherry pick and massage the data used in their analysis. I just think creating two tiers of property investors is a really dumb and unfair idea. If you’re going to cut negative gearing for established property then do it properly. But there will be a time in the cycle where property investment is attractive and at that point, wealthy investors will be given a leg up by the ALP. Agree with BB here; however it’s not just in housing either. In a “normal functioning” market the wealthy are the ones to profit from a market downturn as they have the tax structures (offsetting against other capital income) and capital (not debt) that the working class doesn’t have. They can swoop from the “weak holders” forced to sell in a downturn (margin call, bank calling in a mortgage, etc). The wealthy mostly derive their income from capital, rent and/or businesses they own; not salaries or income. Using your own labor there’s a limit to what most people can reasonably earn; capital has less limits. In Australia we are one of the few economies where the purchase of an investment property is in reach of a decent size of the population; take London or New York for example where most people are renters and landlords are often corporate bodies who can structure themselves in such a way that the average person could not. Besides one argument here is wrong; that the marginal person will buy instead of rent with the removal of NG. That assumes all else being equal; with prices falling construction will pause/tank so this isn’t quite true as once the weak holders sell supply growth will be weak if any. There will just be a different group of winners and losers in this; people with cash to buy the dips will be the winners. Recent buyers especially owner occupied buyers with no other equity will be the biggest losers. The ALP remains vulnerable to a scare campaign about the reduction of the CG discount on investment in new housing. That is a change from the status quo and gives Frightenberg some room to run shrieking through the electorate. Better to use stakes, silver bullets, vampire and holy water to make sure the unproductive rent seeking beast is slayed once and for all. Continue to receive a capital gains discount of 50% on their investments. A few extra new houses never hurt anyone. They have done wonders for rents and house prices in Perth. Looking forward to Bowen saying what the policy will actually do to house prices. They’ll fall. It’s a ‘housing affordability’ policy, after all. Of course he won’t highlight it. Why would he? There’s enough scare mongering as it is. But they are already falling. @jc2610 – Good – we didn’t start that fire then! He’s open to scaremongering by not saying it because the LNP can make up any number they want. I dont see any reason for Bowen to talk about the impact on prices. It is a policy to encourage productive investment – that may or may not have an effect on prices. A lot depends on how fast the people ponzi is running. There is a good chance that the ALP will run it so hot that house prices will remain supported. The bigger threat to house prices is the banker credit crunch. It will lower prices. Subsidised investors have deeper pockets than would-be homebuyers. They may have deeper pockets now but in their absence the RBA/APRA can assist with cheaper more accessible credit for the home buyers and the government can line up a bunch of foreign investors who are keen of a little bit of Aussie sunshine – for cash. 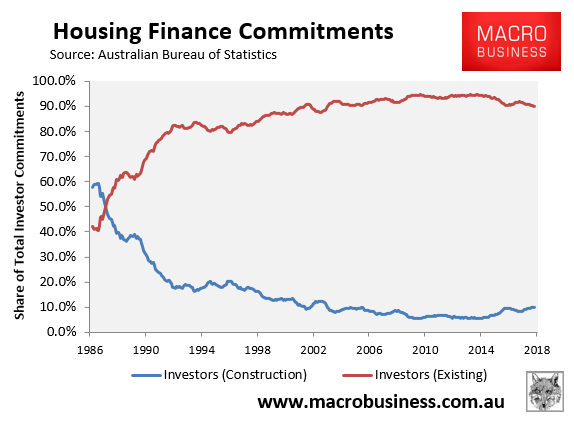 Reforming ND/CGT discounts may have a downward impact price but only as a consequence of successfully diverting sufficient investment to new housing construction to boost the supply of housing enough to keep pacing with a growing Australia. Any comments made (and I don’ think they should) must spell that out. If you give a lollypop to a kid, then take it away, naturally they’re going to scream. And the longer you keep giving them lollies, then suddenly stop, the louder they’re going to scream. It’s like that with any addiction – look how hard it is for people to give up smoking, alcohol, drugs etc. What needs to be pointed out is if you allow property prices to revert back to their mean by taking away all the artificial props, then the rent, by staying where it is, will have property prices more in alignment with the rental returns. Therefore, if we don’t have neg gearing, there will be no need for neg gearing. But this can’t happen without prices falling first. And here’s the kicker – we have had to keep feeding the bubble for so long that as prices have risen more and more out of whack with rents, the need for neg gearing tax rorts have risen too. And then this has been cause for fuelling further prices rises, and so it has continued. If we break the cycle, the pain will be very real for so many. But it shouldn’t have come to this in the first place. As someone on this blog likes to state “the answers lie back in time”. I would agree with most of this; I personally think interest rates being lowered so low (arguably unnecessarily) in 2014-2015 was the last bad move when the economy was in a decent position with a high housing market already – this is what made NG so effective. I don’t think NG has caused the most run in prices although may of amplified the effect a little; immigration (high supply of renters) and continual lowering of the interest rate has instead made NG all the more attractive. Negative gearing has been one of many contributors to the housing bubble along with low interest rates, excessive immigration, foreign investment, SMSF investment and other factors. Taking away one of these, especially a big one like neg gearing would have a huge impact, and may then snowball into other factors. Foreign investors might see that Australia is not as much of an investment opportunity as they once thought, if prices are not continually skyrocketing, due in part to neg gearing. SMSF investors also might not see property as as much of an attractive investment to leverage into. Developers are already slowing down with a slightly falling market. Lower interest rate reduces the benefits of neg gearing, given it lowers interest payments, all else equal. Lower IR rates usually coincide with higher capital returns which is the whole point of a negative gearing strategy (take a loss now; enjoy it as capital growth instead). No point claiming NG if your losing money on the asset’s worth as well. Could any of the supporters of NG point to only one reason why should NG on existing properties remain? Not a supporter or hater of NG/CGT (there’s arguments both sides to me) but the general reasons for avoiding an economic crash/debt deflation could be substituted here. – Mass job losses and/or lack of jobs particularly for younger people without work experience as the economy goes into a tail spin caused by the contraction of credit. This will affect the wider economy not just housing. – Recent families often young with not much equity purchasing a house facing steep losses (FHB’s). You hear talk of negative equity in places like Ireland where many just fled the country in order to escape their debts. Same could happen here with all the social effects this could cause (e.g suicides when people with no equity are in stress, can’t leave/sell/move, high interest rates being mortgage prisoners, etc). – Dollar crashing due to the credit machine stopping (I personally think is a positive – less overseas holidays and cheap things from Amazon). Maybe we will buy more locally, get back to basics, etc. – If they keep immigration high and it actually works then despite houses getting cheaper only people who keep their jobs with pre-crash wages will be able to afford them; affordability may worsen on average despite lower prices due to even lower wages and/or lack of credit availability. Unfortunately secure jobs are rarer and rarer these days. – Less house building in general as no one wants to touch the market and develop land/renovate despite any “tax breaks” that don’t do much to make economics stack up/balance the risks taken. Fundamentally we made a mistake of boosting house prices in the first place. For the same reason a property bought before the introduction of CGT is still capital gains tax exempt if and when you sell it. Retrospective changes aren’t very fair.